Her response to Safaree Samuels’ recent song about their relationship. When Nicki Minaj and her ex Safaree Samuels have addressed their breakup it's been mostly on his terms. Back in January Samuels clued in The Breakfast Club about their split, and this week he went into more detail in a new song called "Love the Most," where he rapped, "What a shame it took a split for them to know I was your man,” he raps. “Got so tired of hiding and head high with no pride in it / Guess I wasn’t cool enough ’cause in our pictures be hidin’ it." Minaj's silence however has ended. 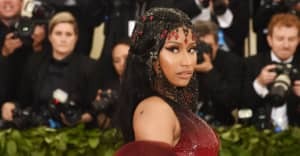 Minaj kept it civil, even while calling out Samuels' "pity party," and ended on a positive note. The MC, who's happily in a relationship at the moment with Meek Mill, coolly handled the situation. "Don't make me do this," she began on Twitter, before implying that the reason behind their breakup was infidelity, without calling out Samuels by name. "Lesson: don't cheat on a loyal woman. God will punish u. When he does, tell people the truth. The truth may set u free. Love. Always." Lesson: don't cheat on a loyal woman. God will punish u. When he does, tell people the truth. The truth may set u free. Love. Always. Enough with the pity party. Just live your life. I'm happy today not b/c of meek. But b/c i know Im a good person. Don't hate u. Will always love u. I forgive u. It's time to move on.